The Grand Canyon is a National Park filled with history and stunning viewpoints. While the Grand Canyon National Park (GCNP) may be beautiful year-round, there's no better time to avoid lines and traffic than around the Christmas holiday. Families and friends looking for a hassle-free, gorgeous, and festive winter vacation should consider making a visit to Arizona's number one attraction, just 70 miles north of Flagstaff. During the winter holiday months, the Grand Canyon and its surrounding area, including restaurants, are decked out in Christmas gear. Travelers can expect a festive atmosphere in the small desert towns, along with a laid-back vibe where guests are unhurried and relaxed. Visitors can also look forward to taking in the changing scenery at the Grand Canyon and enjoying its quiet moments, like the shadows and colors of the sun against the canyon walls as it rises and sets, and the contrast of a light snow against the red rocks. Temperatures are likely to fluctuate in the winter high-desert environment. It's important to be cautious about ice on the roads and trails and to check weather conditions daily. This is especially key if you are planning on camping. Campers should always bring the proper gear including sleeping bags and tents meant to sustain sub-freezing temperatures. The North Rim of the Grand Canyon is closed in the winter. The South Rim is 7,000 feet above sea level, which means snow in winter and cool nights even in summer. High temperatures are in the 30s and 40s (-1 to 4 degrees C) during the winter. All shops, hotels, and restaurants are open during regular hours, making it a perfect place to pick up that last minute gift or to grab a bite to eat while out with your family. There is also a wonderful selection of Native American jewelry, western clothing, souvenir t-shirts, and videos of the Grand Canyon to show or gift to your friends back home. 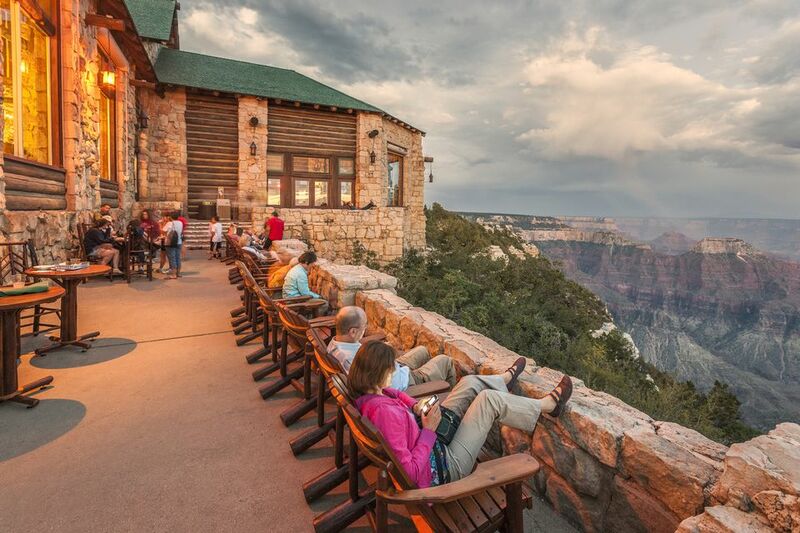 If you have ever waited in line to enter the Grand Canyon National Park or squeezed past a crowd of tourists trying to get a glimpse of the park's beauty, you deserve to treat yourself to at least one off-season visit. During the Christmas season, there are no crowds at vista points and on hiking trails. You will have time to reflect on the beauty of the Grand Canyon, take as long as you wish to compose photographs, and even drive through the park, unlike in peak tourist season when you may have to take the tram. Luckily, rooms are usually available at all lodges during the Christmas season, except at El Tovar, the Grand Canyon's famous historic lodge. For the best selection, travelers should plan to make winter lodging reservations early—ideally during the summer. The hotels are beautifully decorated for the season with garlands and lights, and children will marvel at the "stuffed" animals with Santa hats in the hunting lodge atmosphere of El Tovar. Guests will also find holiday magic in front of the two-story high stone fireplace at Hermit's Rest, amongst other gems. Additional lodging choices including Bright Angel Lodge, El Tovar Hotel, Kachina Lodge, Thunderbird Lodge, and the Maswik Lodge, are all located within the confines of Grand Canyon National Park. Each lodge has a specialty menu for the Christmas holiday which may be viewed in advance of contacting the lodge. Even if you don't stay at the El Tovar lodge itself, it is recommended to make a reservation for their Christmas Eve and Day meals, as the meals are exceptional. The Grand Canyon Railway transports visitors back and forth between Williams, Arizona, and the South Rim train depot. The trips are popular with tourists who enjoy western songs, robbery re-enactments, and the fun bar car. During the holidays, bring the children to enjoy a ride on the Polar Express. The Polar Express travels to the "North Pole" where Santa and his reindeer await. If you just want to travel to the Grand Canyon and are not taking one of the Polar Express excursions, you can take advantage of a 30 percent savings on package deals for the trip and an overnight or two at the Grand Canyon Railway Hotel in Williams.